Sign-up to The Insider to be the first to know about promotions, special deals, events and more. 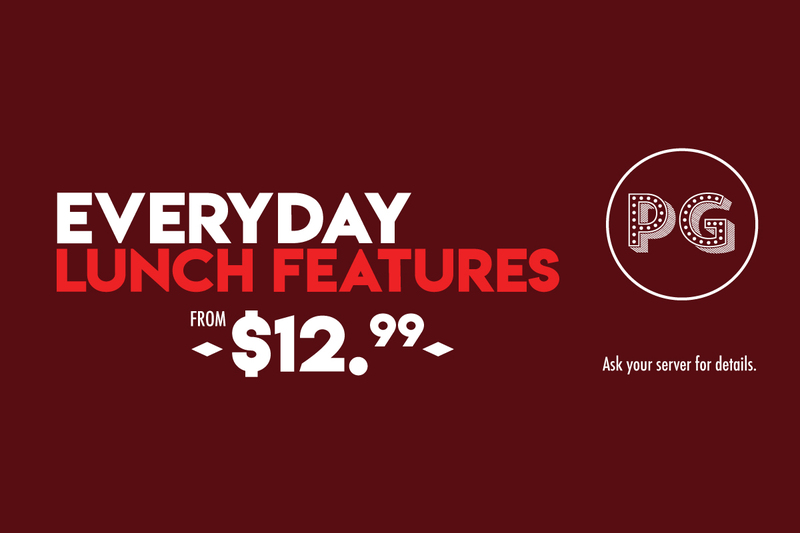 Join us for lunch Monday to Friday before 3 PM to enjoy daily lunch features for just $12.99. See restaurant for full details. Join us on Easter Sunday or Easter Monday for brunch, lunch, or dinner and receive double the Vicinity points on your purchase. Our home made soup of the day. Steamed mussels prepared in our chef’s sauce of the day, served with garlic crostini. Our chef’s signature dish of portabella mushrooms baked with a salumi & fontina cheese stuffing. Our home made focaccia topped with basil, tomatoes & shaved asiago cheese. Assorted cured meats (prosciutto, capicola, salami, soppressata), imported Italian cheeses, seasoned Italian olives and giardiniera. Great for sharing! Lightly dusted, served with a spicy marinara sauce. Home made meatballs a la tradizionale, baked with mozzarella, served with garlic crostini. A rich blend of artichoke, spinach, ricotta & mozzarella cheese, served with focaccia points. Braised asparagus wrapped with prosciutto with an EVOO and balsamic drizzle. Bufala mozzarella, roma tomatoes and fresh basil drizzled topped with EVOO and a balsamic reductio. Crisp mixed greens, green peppers, pepperoncini, sweet onions & tomatoes in a house vinaigrette. Crisp romaine, prosciutto crisps, parmigiano & croutons in our garlic lovers Caesar dressing. Crisp and peppery fresh arugula & baby spinach with sweet red onions, tomatoes and bufala mozzarella tossed in a balsamic vinaigrette topped with strips. Assorted market vegetables topped with goat cheese, served over arugula tossed in a house vinaigrette. Honey roasted pumpkin, spinach, red onion, tomatoes and goat cheese in an Italian vinaigrette. Grilled Free Range Chicken $6.00 or Black Tiger Shrimp (3) MRP. Bufala mozzarella, fresh basil & pomodoro sauce, drizzled with extra virgin olive oil. Prosciutto, arugula, tomatoes, mozzarella, drizzled with balsamic reduction, served bianco. Italian sausage, spicy soppressata, pancetta, mozzarella & pomodoro sauce. Prosciutto, mozzarella, provolone, sundried tomatoes and balsamic cipollini, served bianco or rosso. Soppressata, spicy capicola, pepperoni, olives, hot banana peppers, mozzarella & pomodoro sauce. Roasted chicken, tomatoes, artichoke hearts, bocconcini & pesto sauce. Prepared bianco topped with bufala mozzarella, goat cheese, parmesan, mascarpone & a special blend of herbs & spices. Sundried tomatoes, balsamic cipollini, artichoke hearts, olives, mushrooms, goat cheese, bufala mozzarella & pomodoro sauce. Chicken, rapini, roasted red peppers, tomatoes, artichoke hearts, bufala mozzarella, parmigiana & pomodoro sauce. Pepperoni, green peppers, mushrooms, pomodoro sauce & mozzarella. Served with fettuccine pomodoro (We only use free-range chicken breast & provimi veal). Chicken breast scaloppine prepared with a lemon butter caper sauce, served with spaghetti aglio e olio and crostini. Delicate cutlets of veal prepared in a traditional marsala sauce with mushrooms, served with spaghetti aglio e olio and crostini. "All sandwiches served with balsamic greens"
Provimi veal cutlets or chicken breast prepared a la parmigiano served on our house specialty bun with your choice of toppings (sautéed mushrooms, onions, hot banana peppers). House made meatballs, sautéed peppers, onions, sausage, mushrooms, topped with hot peppers, green olives and mozzarella cheese. A toasted hoagie loaded with salami, soppressata, capicola, provolone & cheese topped with tomatoes & hot banana peppers. All Pasta dishes are served with garlic crostini. Fettuccine sautéed with rapini, Italian sausage, roasted garlic infused olive oil with a splash of pomodoro sauce & parmigiano. Penne tossed in an arabiatta tomato sauce with spicy Italian sausage, sweet peppers & onions. Roasted chicken, roasted red peppers, basil tomatoes, baby spinach ricotta & fresh basil in a garlic infused olive oil. Fettuccine, tomatoes, fresh basil, bufala mozzarella & prosciutto tossed in a garlic white wine sauce. Our home made meatballs, served over spaghetti amarossa topped with parmigiano. Spaghetti prepared a la rustica with olive oil, pancetta, egg, cracked black pepper & grated formaggi. Fettuccine sautéed in a marinello sauce with a fine selection of jumbo shrimp, clams & mussels. Pasta pillows loaded with Atlantic lobster served in a decadent herbed butter cream sauce. Parmigiano and ricotta stuffed potato dumplings in a formaggi cream sauce. Four cheese stuffed tortellini tossed in your choice of Genovese pesto cream sauce or a la vodka cream sauce with pancetta. Served with a robust fresco pomodoro sauce accented with fresh basil. Served with a robust fresco tomato sauce accented with fresh basil. Grilled chicken, spinach, tomatoes and basil in a pesto cream sauce. Honey roasted pumpkin, arugula, parmigiano, toasted hazelnuts, tomatoes, olive oil and herb butter. Fettuccine in a rich cream sauce with a blend of our chef’s select cheeses. Spaghetti with smoked duck, mushrooms, arugula and egg in a white wine carbonara sauce. *Most pastas available gluten free made with gluten free penne. We are proud to source out local & seasonal ingredients, using free-range chicken breast and Provimi veal with no artificial colours, flavours, or preservatives! Home made Italian espresso cheese cake with ricotta and mascarpone infused with Italian Liquors. A gelato snowball rolled in unsweetened caccao with a decadent fruit gelato center. The perfect layered parfait, espresso topped with gelato and a jumbo biscotti. Flourless chocolate cake with a molten chocolate lava center (GF). A selection of rich italian ice creams, all that's missing is the organ grinder and the monkey!